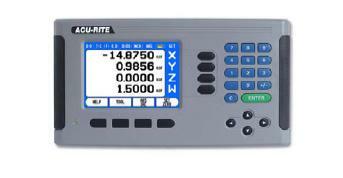 The Acu-Rite 300S 532883-29 Digital Readout (DRO) is for 3-axis turning, milling, and grinding. The 300S is equipped with a 5.7” LCD monitor that replaces the cathode-ray monitor of the VRO300. The “soft keys” are used for diverse functions, mainly for operation and parameterization. The monitor is the same one currently used in the 200S series. In addition, the 300S is capable of all the functions of a programmable counter, such as the creation, editing, storing and running of programs. Numerous programs with differing names can be saved in the program list. Human verification (required): 9 + 8 = ?